This afternoon was quite different from the norm. Because it was a teacher work day, we were allowed an hour for lunch. I didn’t realize that lunch was at 11, which is an hour earlier then I usually eat…so I was pretty pumped about this considering I am starving by 11 for lunch (is that normal??). 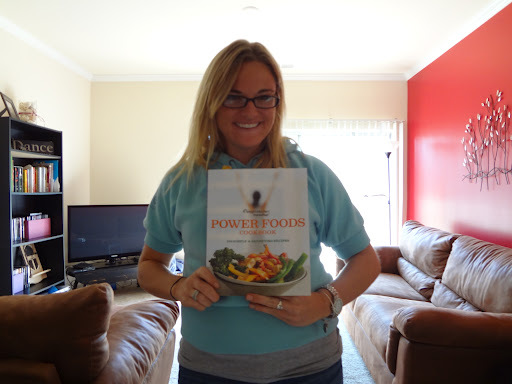 I decided to make a recipe from my favorite cookbook at the moment from the Weight Watchers Points Plus program called the “Power Foods Cookbook”. 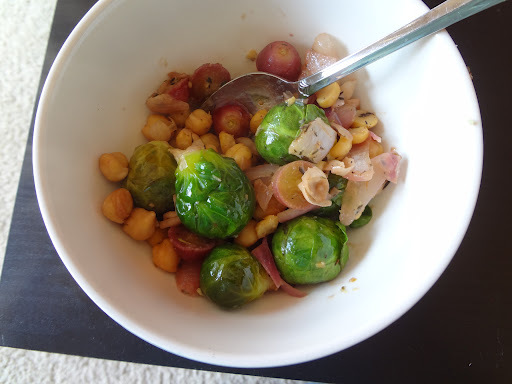 I do try to follow the Weight Watchers program, and find that many of their recipes are simple and delicious! I was excited to be able to have a fresh cooked meal at lunch time instead of my usual packed lunch which can tend to get boring as we all know. 2. Heat oil in large skillet over medium heat. Add the shallot, garlic, and thyme and cook for about 2 minutes. 3. 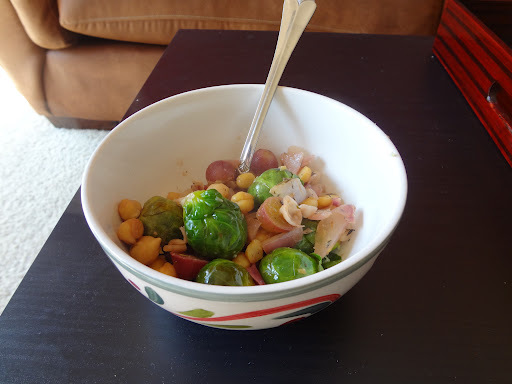 Add grapes and cook for about 3 minutes. 4. 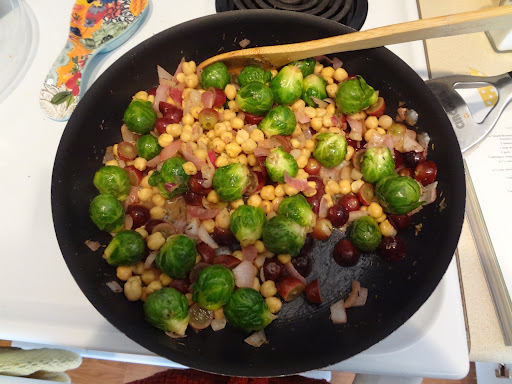 Add brussel sprouts, chickpeas, sherry and salt. Cook for about 3-4 minutes. Add lemon zest! My first bite made me think of Thanksgiving. It was delicious and hit the spot. I also felt really full from just one cup, usually I need more then the serving size to feel satisfied (maybe thats my problem:). I would suggest making as a side with some chicken or great to take and heat up for lunch! 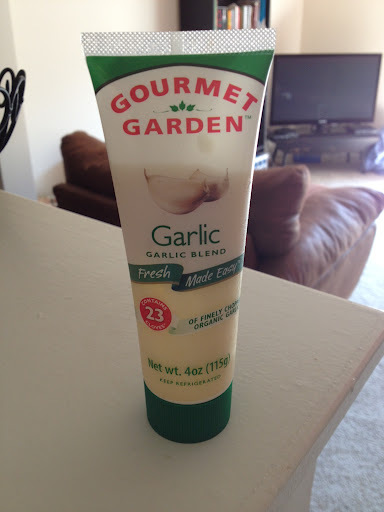 The way I know a recipe is a keeper…. is if you “pick” and eat more before you put away in a Tupperware:) I definitely did that with this one! If you know me, you know I cannot go a day with out a dessert of some sort. Heck, I can’t go a MEAL with out dessert! 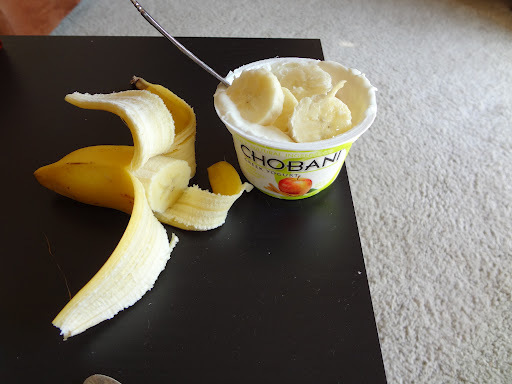 So today I had a Chobani Apple Cinnamon Yogurt with a sliced banana…it was delightful or as my Mom would say “lovely”…she is probably just now eating her “Cottage Cheese and Pineapple”…She is usually eating breakfast when I eat dinner:) love ya mom! Have you learned any tricks from parents, aunts, uncles to help make you a better cook or baker?